Some sites, like www.ChoosePrimavera.com, use popup windows. Those sites may not work correctly if you have blocked popups using your Web browser, a browser toolbar, or another Internet security tool. The instructions below will assist you in allowing popup windows from a particular site only, if possible. Your CoursePlayer site, flipswitch.com, is used as an example. Please note that you may not have the same browser version for these instructions. If the instructions do not match your browser version, please contact Technical Support for further assistance. Go to the Tools menu (if you are having difficulties locating this, press Alt+T on your keyboard). Click on the Privacy tab, then under Pop-up Blocker click on the Settings button. 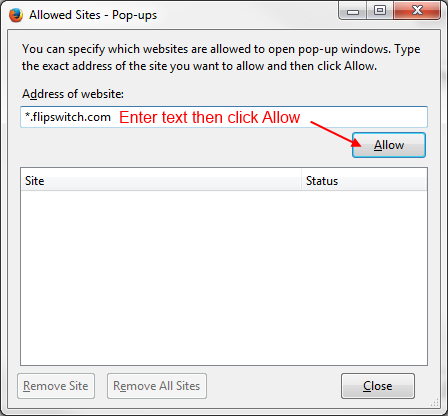 In the Pop-up Blocker Settings window, type *.flipswitch.com as the “Address of Web site to allow” and click the Add button. 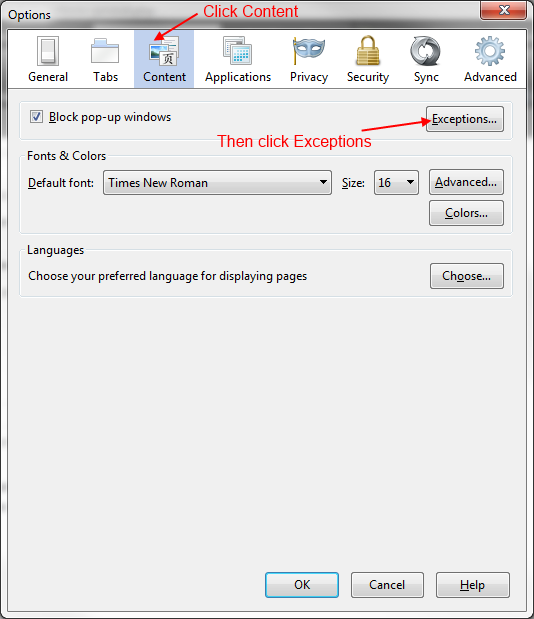 Close the Pop-up Blocker Settings window and click OK in the Internet Options window. If you are still not able to access the PSP site without receiving an error message, you may have a third-party tool blocking popups. See the last section of this page for more details. 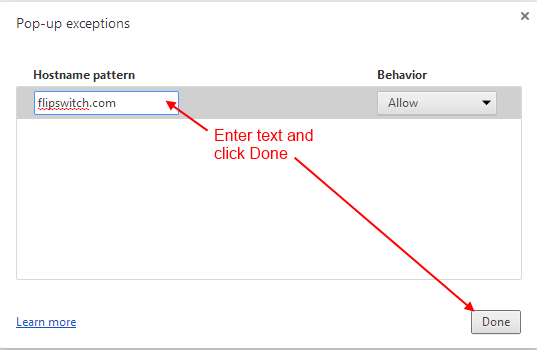 Click Close in the Allowed Sites screen, and then click OK in the Options screen. Close the Allowed Sites window, then close the Content window. In the address bar type chrome://settings/content (you can copy that line and paste it into the address bar) and press Enter or Return on your keyboard. 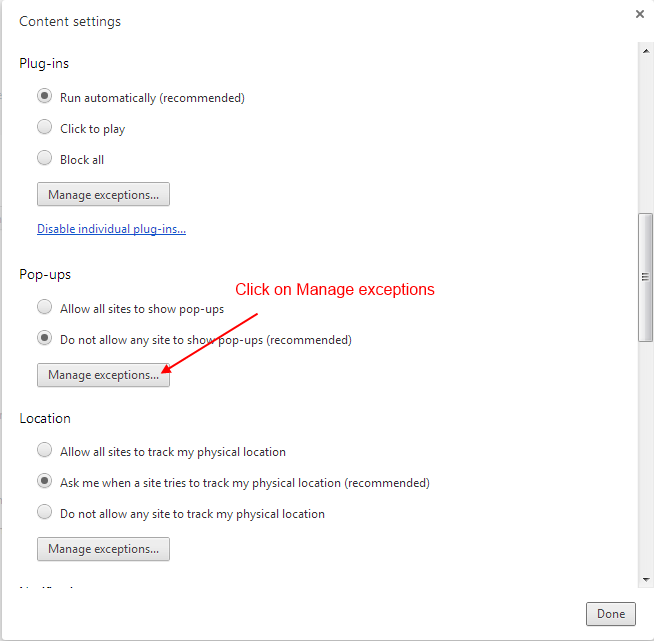 Scroll down to the Pop-ups section and click on Manage exceptions. Close the Settings tab at the top of the browser. Click on the Security tab and uncheck Block pop-up windows. If the option was not checked, or if you are still not able to access the PSP site without receiving an error message, you may have a third-party tool blocking popups. See below for more details. 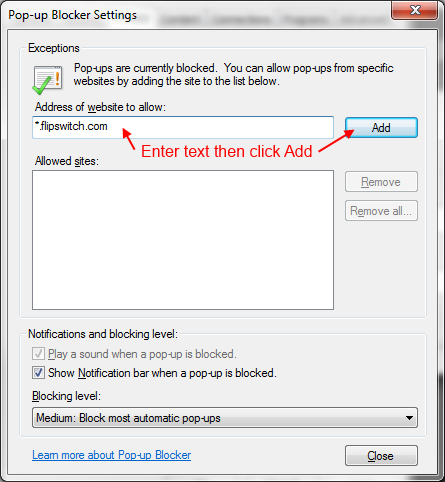 Instructions for some of the most common popup blockers can be found at the links below.